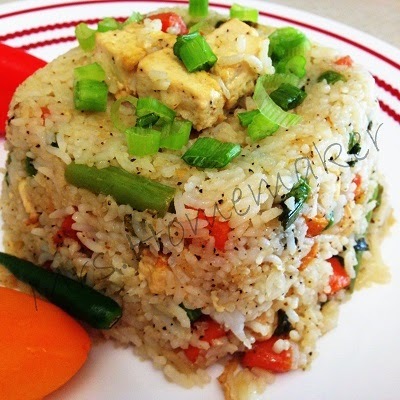 A quick and easy recipe, a rice dish with Chinese delicacies. Step 1:In a wok take olive oil.Fry the ginger,chilly and garlic pieces. Step 2:Break the egg onto the pan and fry well. Step 3:Add all the vegetables and fry them well. Step 5:Now you can add chilly sauce,soya sauce,tomato ketchup,vinegar and ajino moto. Step 6:Toss it all together such that vegetables mixes well with sauces. Step 8:Finally add the cooked rice.Toss it once again. 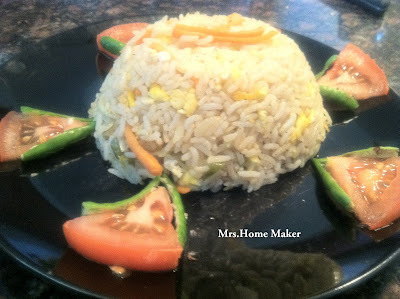 Step 9:Serve hot garnished with some chopped spring onions.